Spirit Airlines can call itself the “most consumer-friendly airline” all it wants, but that won’t change public opinion of the discount carrier. And a new round-up of the world’s worst-rated airlines would seem to confirm that Spirit is far from living up to its own description. Using ratings data from SkyTrax, BusinessInsider counts down the 20 worst-rated airlines in the entire world. Unless you’ve done a lot of globe-hopping, you’re probably not familiar with most of them, like Tajik Air, Rossiya, Merpati Nusantara, Air Koryo, Ukraine International, or Turkmenistan Airlines, the lowest scorer on the list. In fact, only two of the 20 carriers even do business in the Americas — Spirit, and Cubana Airlines — with Spirit being the sole U.S. representative on the list. According to Skytrax, Spirit has an overall score of 45 out of 100, making it #11 in the countdown. It’s currently the only 2-star rated U.S. carrier on the site. 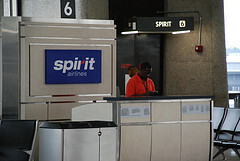 In the breakdown of its ratings, Spirit scores generally mediocre numbers, earning two stars or fewer in categories like Standard of Customer Support Service, Cabin Cleanliness, Responding to Requests, Enthusiasm/Attitude, and explanations for Add-On Charges and baggage. These last two are incredibly important, as Spirit has been leading the way in stripping its fares to the bones then charging additional fees for things that were previously included in the ticket price. The reviews from Spirit passengers are even more harsh, with the airline only averaging a score of around 2 out of 10 on more than 1,100 posted reviews. On the first page of reviews alone, we counted more than 50 reviews that gave the airline 1 or no stars. Meanwhile, only 11 reviewers on that page said they would recommend Spirit. Most U.S. airlines, including American, United, Delta, and Southwest, are 3-star rated by Skytrax. JetBlue and Virgin America each have four stars on Skytrax, while no U.S.-based carriers are currently on the 5-star list. What Are The Best And Worst Airlines For Using Rewards Travel?